In Twitter's world, calling the Muslim Brotherhood a terrorist organization can get you suspended, but those defending Palestinian terrorist attacks and comparing American Jewish kids who join the Israel Defense Forces (IDF) to ISIS foreign fighters rarely face consequences. Twitter CEO Jack Dorsey admitted last summer that his employees have a left-leaning bias, and this is evident both in how Twitter's rules on hate are written and enforced. It should either tailor and enforce them equally or not have them at all. Twitter suspended a Canadian Coptic Christian woman who goes by "Laura" and tweets under the handle @womaninmedicine in September for calling the Muslim Brotherhood a terrorist group. Egypt's Coptic Christians were terrorized by gangs linked to the Muslim Brotherhood in the wake of the Egyptian military's 2013 ouster of President Mohamed Morsi. Several countries, including Egypt, the United Arab Emirates (UAE), Bahrain and Saudi Arabia classify the Brotherhood as a terrorist organization. "What I can't understand is why they'd be offended if I called MB TERRORISTS when MB is outlawed" by Saudi Arabia, the woman, who would not provide her real identity, told the Investigative Project on Terrorism (IPT). 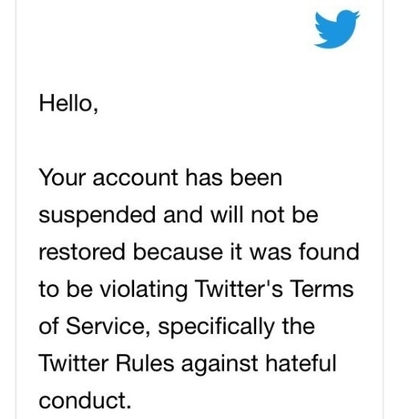 Twitter told Laura that her comment violated its rule on "Hateful conduct: You may not promote violence against or directly attack or threaten other people on the basis of race, ethnicity, national origin, sexual orientation, gender, gender identity, religious affiliation, age, disability, or serious disease." Twitter never clarified how expressing an opinion that the Brotherhood – a religious and political movement – is a terrorist group promoted violence or hate against people based on any protected class. After the suspension drew protests, her account was re-activated and she was told "it looks like we made an error." "I realized pro MB Muslims were mass reporting me every time I posted about it saying my tweet [was a form of] religious discrimination. Various times I've reported tweets for being anti-Christian and nothing happened," she said. "I've resorted to carefully using terminology in my tweets to avoid suspensions now." Twitter flagged an August 2017 post by Islam critic Robert Spencer for saying that "Islam is not a religion of peace. The Quran exhorts Muslims to wage war against and subjugate unbelievers." Right-wing provocateur Laura Loomer lost her account in November chiefly due to a post calling U.S. Rep. Ilhan Omar "anti Jewish" and making statements critical of Islam. Conservative author Elizabeth Kantor was banned in August after she described herself as "whitey" in a post supporting New York Times reporter Sarah Jeong for her #CancelWhitePeople hashtag. Twitter rules forbids accounts from "targeting individuals with repeated slurs, tropes or other content that intends to dehumanize, degrade or reinforce negative or harmful stereotypes about a protected category." Yet that rule raises questions about the permissibility of chronic verbal attacks on Israel. Zahra Billoo, executive director of the Council on American-Islamic Relations' (CAIR) San Francisco-Bay Area chapter, provides an example. Billoo has used Twitter to call Israel a terrorist state, compare American Jews who join the Israel Defense Forces (IDF) to ISIS, defend Hamas and Hizballah rocket attacks against Israel, and to call for Israel's destruction. She repeatedly has referred to Israel in harsher language than the Coptic woman's post that got her suspended. Her rhetoric is similar to that used by white supremacist Israel hater David Duke. "Israel is an apartheid, racist state, which engages in terrorism against Palestinians," Billoo has written at least five times, including three in succession last summer. In one, she said she was repeating "JUST IN CASE THE ZIONISTS DIDN'T HEAR ME." Billoo demonized American Jewish young people who have joined the IDF comparing them to terrorists. "Have more American youth joined the IDF than American youth have joined ISIS? Is one genocidal group different than the other? #CVESummit," Billoo wrote in February 2015. She repeated this point last May: "doesn't see any difference between American youth leaving the country to join ISIS or the IDF. Both are murderous, war crime committing, terrorist entities." She also has repeated a slogan that amounts to a call for Israel's elimination. "From the river to the sea, #Palestine will be free," she wrote in November. Her comment came after CNN fired commentator Marc Lamont Hill for uttering the exact same phrase. "From the river to the sea ..." is used by Palestinian terrorist groups including Hamas, the Popular Front for the Liberation of Palestine (PFLP), as well as by Mahmoud Abbas' Fatah faction and its Al-Aqsa Martyrs Brigade terrorist wing. Hamas' revised 2017 charter still rejects Israel's right to exist. "Hamas rejects any alternative to the full and complete liberation of Palestine, from the river to the sea. However, without compromising its rejection of the Zionist entity and without relinquishing any Palestinian rights," the revised charter states. Twitter's tolerance of rhetoric like Billoo's should not be surprising. Palestinian terrorist groups including Hamas, the PFLP, the Popular Front for the Liberation of Palestine -- General Command (PFLP-GC), and the Al-Aqsa Martyrs Brigades use similar rhetoric and continue to operate freely on Twitter despite an official ban on violent extremist groups having accounts. Twitter is quick to discipline what it perceives as misbehavior from voices on the political right, while giving a pass to voices on the left, said Middle East Forum President Daniel Pipes. Pipes believes that the way Twitter's rules on hate are written and implemented is politically biased. "Twitter, like Facebook, Google, and other internet giants, has unfortunately slipped into a pattern of permitting misbehavior from the Left and its allies (especially anti-Zionists) while it cracks down on perfectly civilized statements coming from the Right," Pipes said in an email. "Like universities, the internet services are headed down a dark road that will end badly unless they quickly fix this problem."